Developing Assertiveness and Avoiding Conflict – Let's Go! ... it's such an important life skill, after all. Assertiveness training, assertiveness inventory, assertiveness skills - all are covered, I think. Or, in other words, the world expresses its love when you express your love, the world SHINES when YOU shine. showing the world WHO you are! Once you understand that you're actually doing the world a favour, therefore, by being assertive it makes developing your assertiveness skills much less about you, and much more about the rest of us. Don't you see! Having said all that I will stress that assertiveness has not been my strong point in the past and I'm as eager to learn how to develop assertiveness as you might be. So I shall simply say that Michael's assertiveness wisdom is thought-provoking. Watch, and listen, closely! And let me know what you think about assertiveness! 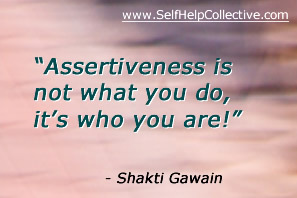 Share this developing assertiveness page - thanks!